There is a Turkish saying that goes, "A single cup of coffee is remembered for 40 years." However, a cup of Turkish coffee at Gbtimes Turkey, the first Turkish media broadcasting Chinese music, is far more than a good impression on the Sino-Turkish friendship. Against the backdrop of increasing tensions between Turkey and western countries in recent years, China's Belt and Road Initiative (BRI) has become increasingly popular in Turkey, said Kamil Erdogdu, chief editor of Gbtimes Turkey, adding that the Turkish people believe that the initiative will provide mutual benefits. "Especially in the last two or maybe three years, Turkey has started talking much more than before about China, about Chinese culture and of course the Chinese economy, because of the Belt and Road Initiative," Michael Kuyucu, group CEO of Gbtimes Turkey, further explained. In Kuyucu's view, the initiative may even change the balance of the world. For more than 100 years, the center of the world has been the West; however, the East will be "more important, more popular and more dominant" in the world due to the BRI, he said. "This is not just a basic transportation project," Kuyucu said. "It is transportation of science, culture, language, economy, and everything." Yuksel Mansur Kilinc, now a deputy of Istanbul at the Grand National Assembly of Turkey, the country's unicameral legislature, expects more to come from the Sino-Turkish relationship. 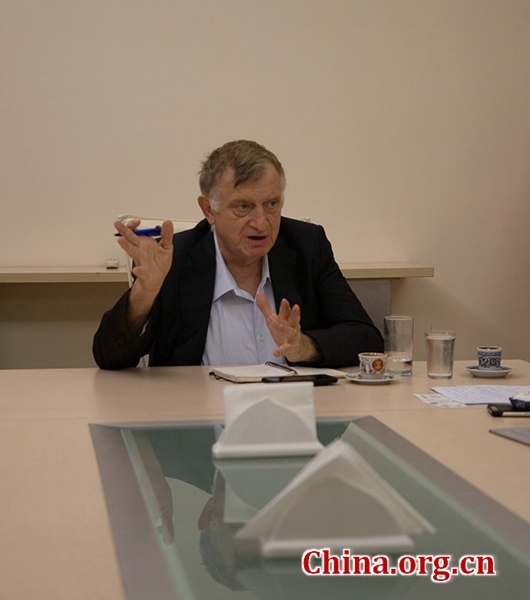 "Chinese history has much in common with Turkey's, and both countries suffered a lot in the past; however, the exchanges between Turkey and eastern countries are not as much as we expect," said Kilinc. "China and Turkey should promote their relationship to a higher level." Kilinc is also the founder of Yon Radio, a top 10 ranked station among 850 Turkish radio stations and also the best-known Turkish radio station in China. Early in 2011, according to Kilinc, Yon Radio and China Radio International (CRI) proposed building a new digital silk road between the easternmost and westernmost parts of Asia, that is, China and Turkey. He believes that such efforts, especially the BRI, will be beneficial to all human beings and drive the development of surrounding areas. "Now, as Turkey's main opposition Republican People's Party deputy, I will try every means to promote Turkey-China cooperation in media and in terms of anti-terrorism cooperation," said Kilinc. Halil Ibrahim Torer, an engineer at Yon Radio, has been to China three times. With a clear and sweet recollection of Beijing duck as well as old wooden buildings and stone bridges in Wuzhen, he expressed support for the BRI, adding that the Turkish people like Chinese culture and their impression of China has been changing. "Twenty years ago, if you said 'Made in China,' it means a replica of something, not original. But now this idea has changed," said Torer. "Now Chinese commodities are good." He believes the BRI is a way that is ready to bring the two peoples closer together, not just in terms of economic and cultural improvement between the two countries. Against the backdrop of increasing tensions between Turkey and western countries in recent years, more and more Turkish people believe that the Belt and Road Initiative will provide mutual benefits.